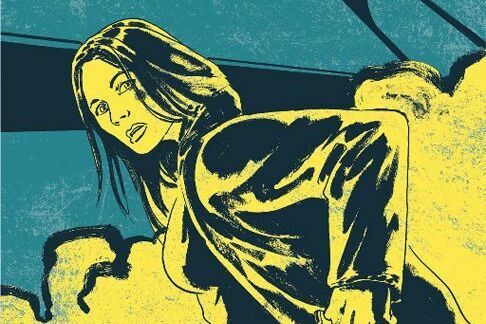 The Eisner-winning graphic novelist on the next volume in his noirish Dex Parios series; meanwhile, publisher Oni Press keeps Hollywood on speed-dial. Things get gritty in the Rose City when P.I. Dex Parios's BFF is brutalized following a Timbers match. 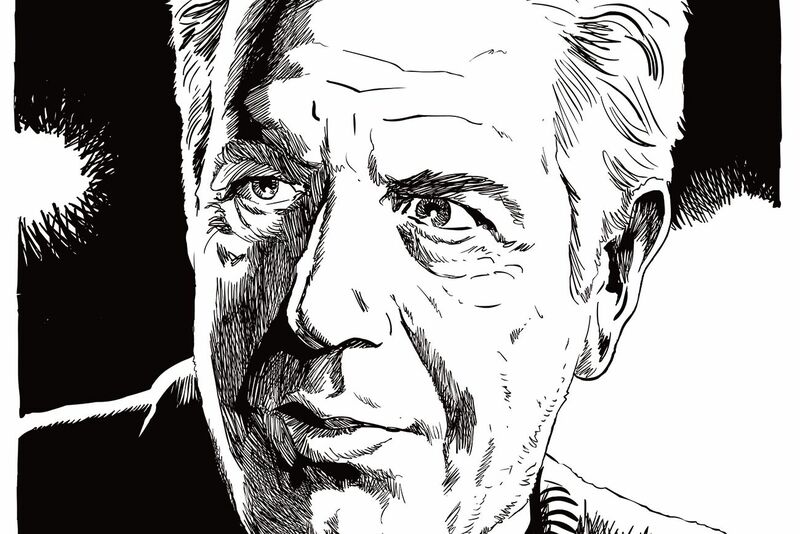 Dex Parios—the grouchy, addiction-prone P.I. 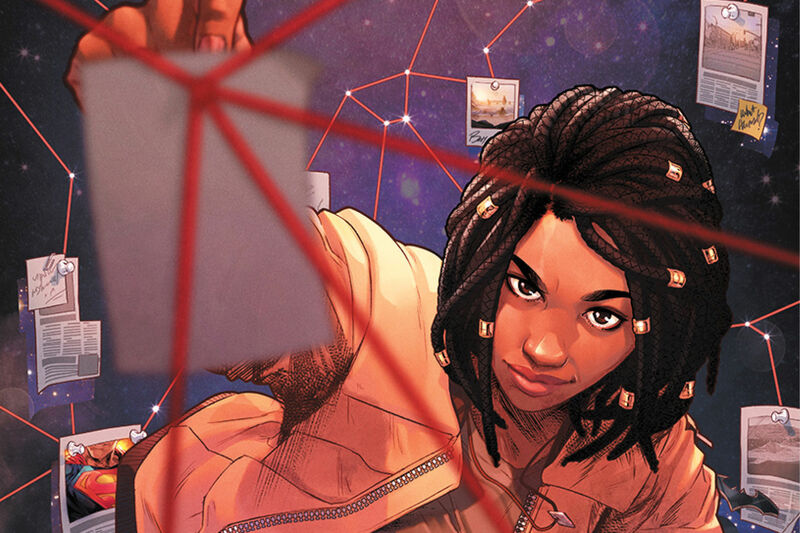 of Greg Rucka's Stumptown series—may have an acute sense of justice as she gumshoes through our familiar streets (rendered, in new Vol. 3: the Case of the King of Clubs, by artist Justin Greenwood). But when she takes a case, she doesn't play by the rules. That also true of Stumptown's publisher Oni Press, the local indie house that brought us Scott Pilgrim vs. the World and recently made headlines for a $30 million film deal with Fox for Antony Johnson's 2012 graphic novel The Coldest City (set to star Charlize Theron). Oni describes its output—more than 120 titles that run the gamut from thrillers and romances to YA noir—as “real mainstream.” That simple phrase, which frames superheroes as niche and everything else as potentially mainstream, is at once an inversion of and ballsy correction to comic industry conventions. Oni’s assumption is that comic books are for everyone. Certainly the production houses seem to agree, with six Oni titles already optioned, including two of Rucka's. 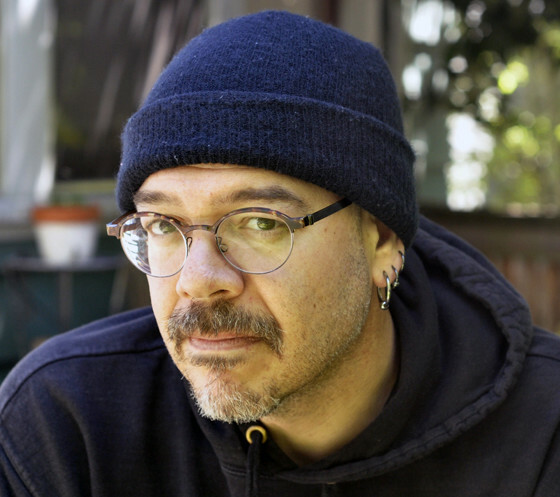 Greg Rucka moved to Portland fifteen years ago from "Steinbeck Country" (California's central coast). ON PORTLAND: “I love the sincerity of this town and its absurdity.... I love that there are signs up in my neighborhood objecting to the construction of condos because aesthetically it is not appropriate. I love that we have so many of the problems that any major city has, but always with a Portland twist. Our corruption is Portland corruption." ON THE DETECTIVE GENRE: "A mystery is at its root a question of what went wrong, and when you ask what went wrong, you are asking a societal question. I believe very strongly that the private eye is a uniquely American genre that exemplifies what art needs to do. It's not enough to entertain; for a story to matter it has to have more. There must be more. That is an artist’s responsibility." ON ARTIST JUSTIN GREENWOOD: "Justin doesn’t make safe choices. He tests himself, he tests me, and that kind of energy is infectious. This art is absolutely uniquely his. 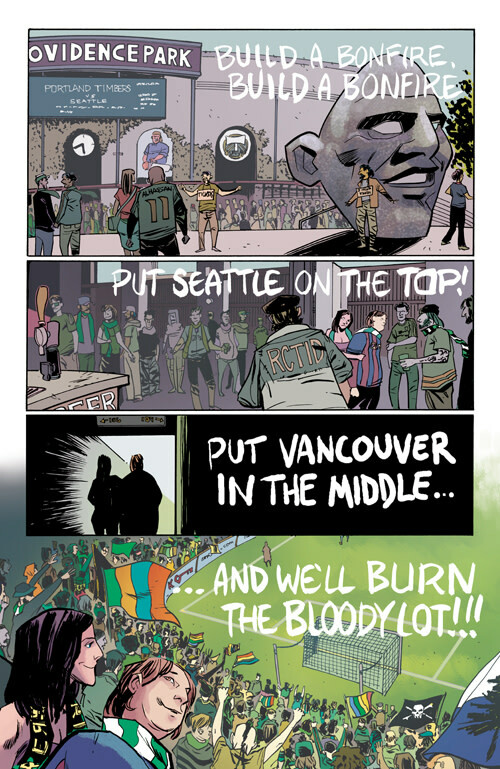 The soccer fans chanting at Providence Park—I got these pages back and said 'holy mackerel!' I mean you can feel the noise. I thought that was just beautiful." ON THE BOOK THAT CHANGED HIS LIFE: "There is a very specific book that my mom put in my hand that, if she knew what she was doing, she never would have. It’s Stuart Kaminsky’s Murder on the Yellow Brick Road. It is set in pre-WWII Los Angeles; one of the little people who played a munchkin in the Wizard of Oz was murdered, and this P.I., Peters, is hired by Judy Garland.... That book sent me down a rabbit hole. As I got older, I realized he was talking about prejudice, celebrity culture, the isolation that his fictionalized Garland is feeling. He addresses racism, internment camps, the treatment of Japanese-Americans. That book either saved me or broke me." 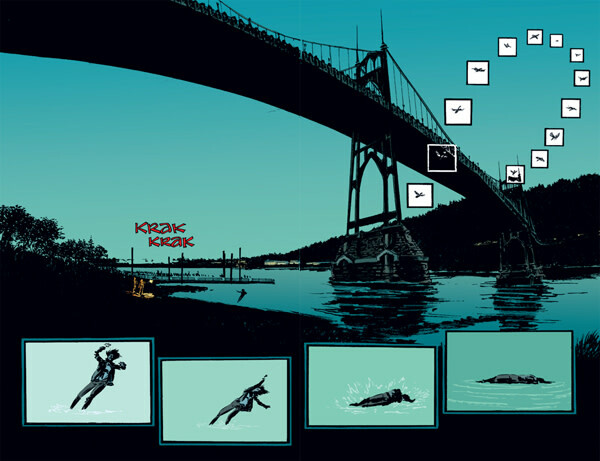 The St. John's Bridge in Stumptown Vol. 3.